"Untitled. Acrylic on canvas. 42 x 48 cm. 1976. Courtesy Rafael Pérez-Hernando Arte Contemporáneo"
"Untitled. Ink on paper. 8 x 12,8 cm. 1970. Courtesy Rafael Pérez-Hernando Arte Contemporáneo"
"Untitled. Acrylic on canvas. 1976. Courtesy Rafael Pérez-Hernando Arte Contemporáneo"
"Untitled. Color pencil on paper. 1973. Courtesy Rafael Pérez-Hernando Arte Contemporáneo"
Three years ago I discovered the work of Giorgio Griffa (born in Turin in 1936). Since then, he has remained in my mind like a haven of tranquillity, transcendence, harmony and mystery. I was mesmerised by the simplicity, reticence and beauty of his work whilst at an art fair, an unusual place for the work of an artist to really grab one’s attention. Nevertheless the memory of Griffa’s work remained firmly in my mind. There is an element of the paradoxical in creating this catalogue, because I find it almost impossible to reproduce the colours and textures used by Griffa. But in this sense, I think that his pieces perfectly illustrate Walter Benjamin’s idea, which he explained in his essay The Work of Art in the Age of Mechanical Reproduction written between the two world wars. Here Benjamin discusses how the aura of a work of art is lost if it is reproduced. 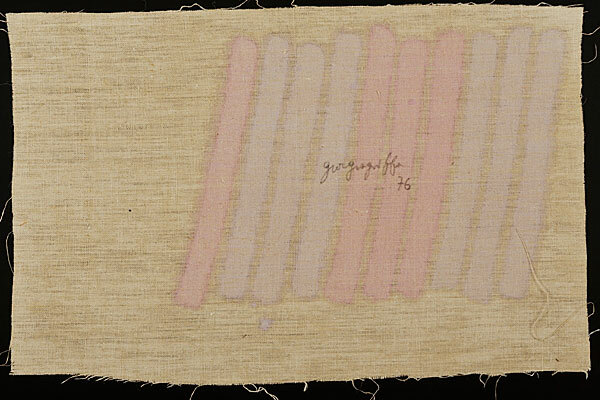 The delicacy and almost mystical beauty of Giorgio Griffa’s fabrics cannot be copied by any reproduction technique, however advanced it may be. 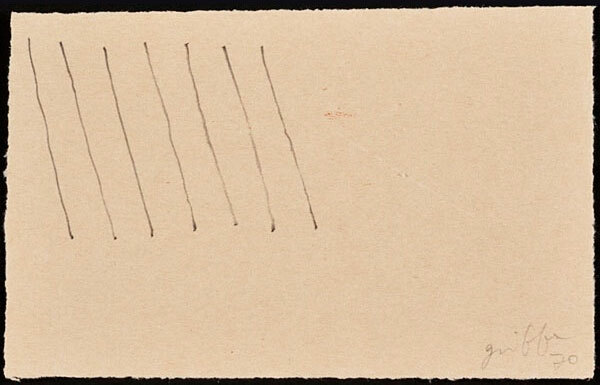 In fact, one of the basic principles of Griffa’s work (namely to give a place to the natural evolution of the elements he uses as they pass through time) is very starkly opposed to the fixed, static images that document a work of art at a single point in time. Because to Griffa it is essential that pieces of art can continue to live by themselves after the artist has worked on them – once he has put his brush to the canvas or his pencil to paper. The changes that occur once the piece is completed are just as important as the work of art itself. Just as a piece of loose fabric evolves over time, it changes colour, it wrinkles and its edges become frayed, so too does colour change with time. So you may well ask, why bother writing this catalogue? Because in my opinion Giorgio Griffa deserves as much attention as possible. In 2015 a number of important contemporary art galleries, including the Centre d’Art Contemporain de Genève and the Secession in Vienna, will be exhibiting his work. They will be paying tribute to a lifetime of private, contemplative and humanist work that is gaining international acclaim. And we would like to be part of that tribute. The captivating restraint of Griffa’s work, despite its apparent simplicity, gives way to a number of ideas. Griffa was part of the artistic movement "pittura pittura" (also known as Analytical Painting). At the end of the 1960’s and throughout the 1970’s the movement sought to defend the transcendence of abstract painting against conceptual art and arte povera, a modern art movement gaining much popularity at that time in Turin (the artist’s birthplace). The defenders of the "pittura pittura" movement argue that the basic elements of painting, such as surface, colour, and subject matter, are all ways for the painter to express himself, and are just as valid as the alternatives used by conceptual artists. They believe that painting, with its historical legacy, can be used to transmit ideas and concepts in the same way conceptual art can. 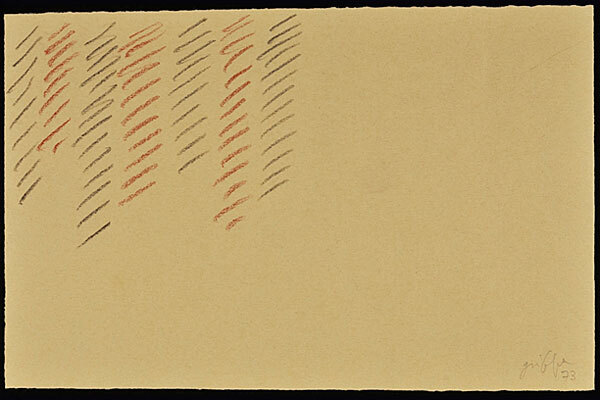 "By repeating shapes… you find a rhythm, a basic instrument in the search for knowledge." "The repeated shapes are similar but never identical, because of the nature of our hands; and this is a metaphor of the continuous transformation of nature." 2 Giorgio Griffa. As a true heir of the Renaissance, the artist uses a lot of white in his works, contributing to the creation of a universal alphabet. The shapes, the numbers, the lines, the colours are all signs of life, energy, transformation, knowledge – different in their similarity. Through his silent strokes Griffa speaks of creation, evolution, and the balance of the circle of life. He is only minimally involved in his paintings and drawings leaving them to the direct influence of time and of other external elements, This leads us to the essential core and helps us remember how simple yet how complicated it is to reach the very essence of existence. Their silent beauty penetrates our memory and makes a deep impression on our contemporary world overloaded with content and imagery. 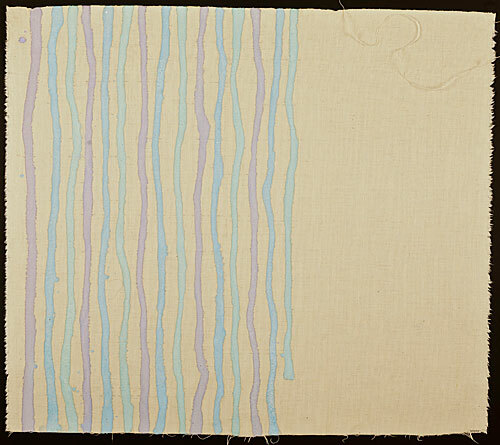 The work of Giorgio Griffa remains magically suspended in time, free of predictable elements. His pieces are an open invitation to stroll through the evocative, mysterious and profound paths they recall. Writing this text in a world troubled by religious conflicts, this quote by Barbero referring to the importance of time in Griffa’s work takes on a double meaning. A range of signs, numbers, alphabets, arabesques and lessons of peaceful dialogue between different cultures coexist as siblings in Griffa’s work. His universal language should reach out to all five continents. With this catalogue we hope to disseminate his fantastic work and important message. 1 Giorgio Griffa. Catálogo Galleria Salzano, Turín Octubre de 2000.